Could you volunteer to help us make The Hospice Herd? Would you like to become a “Hospice Herder” and help to make our popular Sheep and Highland Cows? 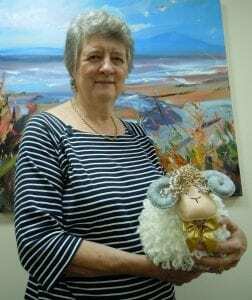 Led by Margaret Harkins, our craft group volunteers in Workington have now made almost 1000 of the sheep and highland cow doorstops, which we affectionately refer to as The Hospice Herd. Recent coverage on television and in the papers has resulted in a huge demand for these handmade characters. We have been inundated with requests from as far away as Australia and America! Sales of these doorstops have already raised over £10,000 to support our charity and we know there is a demand for them. You can do this in your own home. We will give you training and the materials, your donation to us is your time and skill. We are also looking for someone to lead this group of volunteers to make the project seamless. If you would like to find out more about how you can join our Knitting Ninjas, know a Super Stitcher or would like to help in some way, then get in touch with our volunteer coordinator, Teresa on 01900 873173 or email us on info@hhwc.org.uk. Reg. Charity No. 1086837 Reg. Company Limited by Guarantee No. 4191126 Reg. Office: Upper Floor, Cumbria House, New Oxford Street, Workington, CA14 2NA.